The Sony Center is a Sony-sponsored building complex located at the Potsdamer Platz in Berlin, Germany. It opened in 2000 and houses Sony's European headquarters. Sony Center contains a mix of shops, restaurants, a conference centre, hotel rooms, luxurious rented suites and condominiums, offices, art and film museums, cinemas, an IMAX theater, a Legoland Discovery Centre, and a "Sony Style" store. Free Wi-Fi connections are available for all visitors. During major sports events like the 2006 FIFA World Cup, the centre also had a large television screen on which the games were broadcast to viewers sitting in the large open area in the middle. 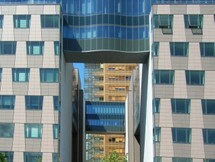 The Sony Center is located near the Berlin Potsdamer Platz railway station, which can be accessed on foot. 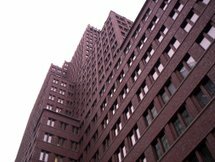 A large shopping centre is nearby, as are many hotels, the Deutsche Bahn central offices, and an office building featuring the fastest lift in Europe. The illumination of the Sony Center roof was implemented by the Parisian Lighting Artist Yann Kersalé. His idea was to underline the spectacular roof construction of steel, glass and fabric. Kersale’s vision was to have clear glass and translucent fabric reflecting the daylight as well as the moonlight in a very extraordinary way. In his concept, the transparent structure of the roof serves as a projection surface for the changing light. The colors alternate from cyan to magenta, in order to represent the sunset. In the evening the lighting spectacle begins with white light, which lets the day appear to be longer. At nightfall, the lights in the Forum turn on and the roof constantly changes its colors. A sequence of this streaming play of colors lasts about 21 seconds and repeats itself without interruption until late at night.